Ohio’s Republican Gov. John Kasich loves to stand for something, even if that means being on both sides of an issue when he can. He appears to have done it successfully again, this time taking bows for inviting DREAMers to come to Ohio, when not too long ago he told Syrian refugees they were not welcome. Back in November of 2015, after he had declared his second run for the White House and while Barack Obama was still president, Kasich told an audience at the National Press Club that he opposed allowing refugees fleeing the war in Syria to come to Ohio because he did not believe the Obama Administration had screened them well enough. Fast forward to today with Kasich’s political nemesis Donald Trump as president, Ohio’s term-limited, lame-duck leader is singing from a different hymnal, now that DACA (Deferred Action on Children Arriving) is the big buzz of the day following the White House’s decision Tuesday to rescind the program Obama put in place through an executive order. Kasich spent 18 years as a congressman and knows Washington inside and out, as he told GOP primary audiences last year when he lost 49 state primary contests. The former Lehman Brothers banker and Fox News TV pundit flippantly said it should take six hours, not six months, for “reasonable” members of Congress to figure it out. It’s now a “simple moral issue” on DACA for the Catholic boy from Pennsylvania who once wanted to become a priest instead of a screening issue as he said it was with Syrian refugees fleeing a war-torn land only 22 months ago. Kasich shocked many by again inferring he was among “common sense, normal thinking Americans,” when he was clearly not among that group when it came time to accept Syrian refugees, even though other American states and even nations like Canada and Germany accepted more than their fair share. Kasich ought not to count himself among “common sense, normal thinking Americans” in light of his decisions on women’s health rights, subverting public schools, selling off state assets, opposing unions for their collective bargaining power, and issues too numerous to list here. Kasich showed a lot of brass by declaring that DREAMers have a home in Ohio. For Ohio’s Future Action Fund said about 4,400 young people in the program reside in Ohio. Another sympathetic group working to save the program, Interfaith Worker Justice, said Ohio would lose “more than $251.6 million annually in state gross domestic product if the state’s 3,865 “Dreamers” who work leave the workforce,” according to the Dayton Daily News. The White House said that 800,000 people impacted by the president’s decision will not be forced to leave the country for another two years. Kasich has again exposed himself for what he is, a political chameleon on one issue after another, if it suits the circumstances and his political aspirations to be a gadfly that pops up from time to time to speak to east coast media who have no clue, and apparently don’t want to have a clue, about how poorly he’s run Ohio for the last seven years. 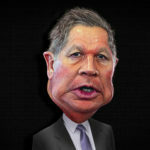 Meanwhile, the bright lights from CBS, CNN, and other media focus only on national issues and topics, leaving hypocritical governors like John Kasich to dream on that his voice will be heard and respected when what he’s done back in Ohio doesn’t easily fall within the definition of common sense or normal thinking.